Background: Today, new lifestyles, higher incomes and consumer awareness are creating consumer demand for a year-round supply of high-quality, diverse and innovative food products. However, when it comes to innovation, the food sector is less changeable when compared to other sectors, such as high technology. Still, in the past decades much and important developments have been achieved in several areas related to foods and the food industry. Methods: A systematic review of scientific literature was conducted on Science Direct. 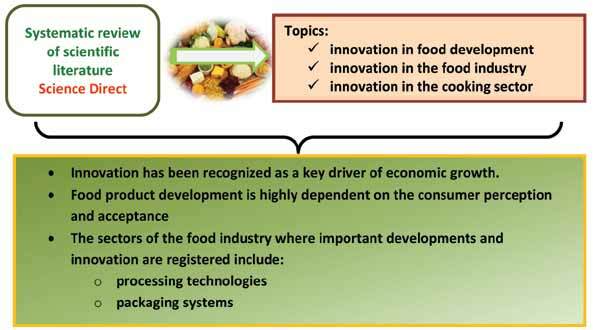 The topics investigated were: aspects related to innovation in food development (such as the transfer of innovation, open innovation, collaborative innovation and consumer perception and its role in the developing process); the innovation in the food industry (particularly regarding the processing technologies and packaging, which are two prominent areas of innovation in this sector nowadays); the innovation in the cooking sector (particularly in regards to the molecular gastronomy and science based cooking). Results: A total of 146 articles were included in the review and the aspects focused allowed confirming that innovation has been recognized as a key driver of economic growth. Within the framework of ‘open innovation’, a number of key issues related to the acquisition of external knowledge in food technology must be taken into consideration. Food product development is highly dependent on the consumer perception and acceptance, and hence it is of utmost importance to include the consumer in the development process to minimize failure probabilities. The sectors of the food industry where important developments and innovation are registered include the processing technologies and the packaging systems, where the latest progresses have produced very significant outcomes. Conclusion: The present work allowed verifying the latest improvements and trend towards food product development from two perspectives, the product itself and the industrial processing. This sector is undoubtedly a major key for the success and competitiveness nowadays in the food industry. Food innovation, sensory perception, consumer acceptance. Quinta da Alagoa, Estrada de Nelas, Ranhados, 3500-606 Viseu, Portugal.